Bouchette, the Bassett Hound, followed me as I climbed the tiny streets of Gorbio village. When she got to this pump, she stood with her head under the tap waiting for me to turn the handle and give her a drink. 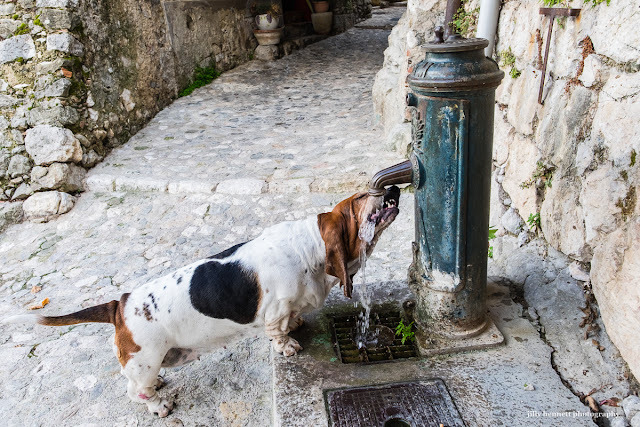 Bouchette, le Basset Hound, me suivait alors que je montais les ruelles du village de Gorbio. Quand elle est arrivée à cette pompe, elle a mis sa tête sous le bec de sortie d'eau en attendant de moi que je tourne la poignée pour lui donner à boire. Great photo, Jilly! I have long maintained that dogs are the real dominant species, and they have trained humans to meet their every need. They even let us think we are the masters to keep us happy. She's adorable! Wonderful shot, Jilly. Oh how sweet, what a smart girl.